A facsimile of a deck of cards originally printed by Lawrence and Cohen, they include square-cut corners and two ace of spades (The original blue-colored ace with an American eagle, and a more standard-looking ace for people who find the original one confusing) They come packaged in a box printed with a facsimile of the original 1-cent tax stamps with an 1864 cancellation mark. These are a great compromise for people who want a period looking deck, but want the durability of a modern coated deck. They have a coating but with a matte finish so they are not as shiny as some plastic coated decks. Although they are based on an American deck, very similar cards were printed both in England and America. In fact, many early American card printers learned their trade in London, or imported the printing plates from England. 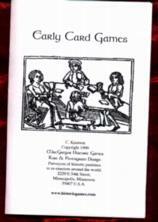 Order 4 decks and we include our booklet of early card games!